In this Task, VPL Team members make observations of Solar System and extrasolar planets, develop astronomical and remote-sensing retrieval methods, and use telescope and instrument simulators to determine required measurements, observing strategies, and analysis techniques for exoplanet characterization. New simulation capabilities are validated against the Earth datasets provided in Task A. To assess the detectability of signs of habitability and life, input spectra for the simulators and detectability calculations are generated from the environments developed in Tasks A, B, C and D.
Atmospheric spectra of a handful of transiting Jovian, mini-Neptune planets currently exist, but spectroscopy of transiting super-Earths will likely await the launch of NASA’s JWST. Direct imaging of Earth-sized planets in the habitable zone awaits the development of TPF-class missions. In all these cases, the data returned will be far more challenging to interpret than conventional terrestrial or planetary remote-sensing observations. The spectral resolution, spectral range and S/N are likely to be minimal, and the disk of the planet will be unresolved (disk-integrated), so planetary spectra will include mixtures of surface types and cloudy and clear scenes, and the planetary environment may be unlike anything currently known. To prepare for the interpretation of this challenging data, VPL team members explore and quantify the types of signals we might expect to see from different metabolisms and planetary environments. For more information about VPL's relevance to NASA missions, click here. Examples of our recent work include a variety of tools and techniques to discover and characterize exoplanets. In recent exoplanet discovery and observations, Agol was part of the 'Citizen Scientists' team that discovered a new super-Neptune planet and characterized its multi-planet system (Schmitt et al., 2014). This demonstrated techniques to determine precision masses of exoplanets, which can be applied to habitable zone exoplanets in the future. Agol was also involved in detecting and characterizing new planets in the Kepler data, including the first 7-transiting planet system, Kepler-90 (Lissauer et al., 2014) Raymond was part of the team that discovered Kepler 186f, the first Earth-sized planet found in the habitable zone of an M dwarf star (Quintana et al., 2014). VPL members Sheets and Deming (2015) measured and coadded reflected light from Kepler planets smaller than Saturn, finding that they have low (~20%) geometric albedos. This new technique probes the nature of small planet atmospheres and may eventually lead to an understanding of the atmospheres of super-Earths. In exoplanet spectroscopy, Deming participated in HST transit observations of HAT-P 11b, a Neptune-sized planet that showed clear skies with water vapor absorption clearly detected in the spectrum (Fraine et al., 2014). We hope to extend this measurement technique to transiting habitable super-Earth (to be discovered by TESS). 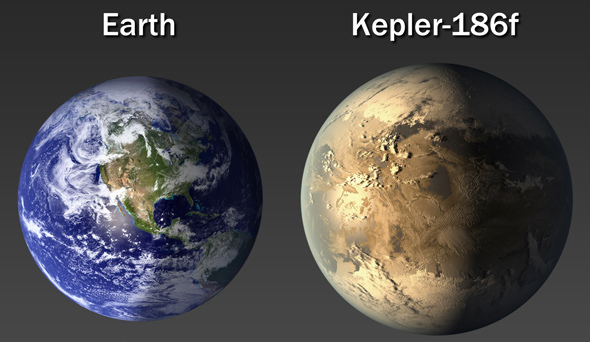 An artistic depiction of Kepler 186f showing its size relative to Earth. In addition to observations, we have recently developed several new detection techniques for planets and their moons. New, fast techniques to calculate the size of the perturbation expected to planetary orbits as planets pass by each other were developed that can potentially be used to measure the masses of Earth-sized exoplanets with JWST (Deck & Agol, 2015). Agol, Robinson and Meadows developed new techniques to detect and characterize exomoons and their parent planets, using spectroastrometry, the measurement of the center of light in a planet/moon system at different wavelengths (Agol et al., 2015). This technique may allow for detection of potentially habitable exomoons, as well as mass measurements and disentangling of the spectra for the exoplanet/exomoon system. Misra, Krissansen-Totton and colleagues collaborated on a paper to understand whether a volcanically active planet could be identified using transmission spectra by searching for the sporadic formation of high altitude hazes due to volcanic outgassing (Misra et al., 2015). Robinson co-wrote a study of techniques for 1-D thermal structure modeling for planetary and brown dwarf atmospheres (Robinson & Marley, 2015). 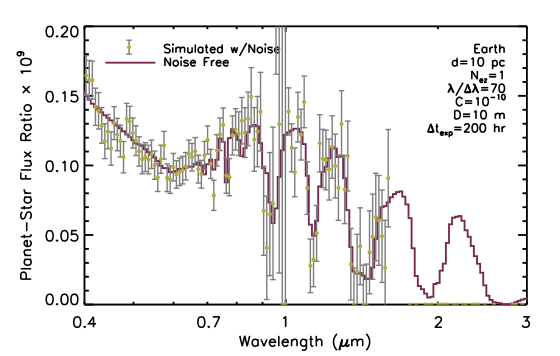 And in further developments in instrument models and retrieval for potentially habitable exoplanets, Robinson and colleagues developed an instrument noise mode suitable for studying the spectral characterization potential of a coronagraph-equipped, space-based telescope and applied it to a broad set of rocky and gaseous exoplanet types (Robinson, Stapelfeldt & Marley, 2015). This is being used to explore the capability of near-future coronagraphic missions (like WFIRST-AFTA) to detect biosignatures gases in the atmospheres of nearby Earths and super-Earths. The Robinson et al. (2015) coronagraph simulator produced this spectrum of an Earth twin around a solar twin at a distance of 10 pc as observed by a 10 m space telescope over a 200 hour integration. The dark red line is a noise-free spectrum, while the yellow points are a simulated spectrum with 1 sigma error bars. VPL research is now developing better ways to identify abiotically produced O2/O3 by determining which gases or other environmental characteristics are more likely to be present for abiotic generation. As the direct detection of nitrogen would provide a means to characterize the bulk atmosphere of potentially habitable exoplanets and constrain the likelihood of oxygen production by abiotic processes, Schwieterman, Robinson, Meadows, Misra, and Domagal-Goldman explored a novel way to detect and quantify N2 in planetary atmospheres (Schwieterman et al., 2015). Although the N2 molecule is extremely challenging to observe in exoplanet spectra, N2 has a collisional-induced absorption band near 4.2 µm, which is significant in Earth's spectrum and potentially in those of Earth-like exoplanets with similarly N2-dominated atmospheres. The VPL team quantified the potential magnitude of this spectral signature by producing synthetic transit transmission and radiance spectra using VPL radiative transfer models. In another study, VPL Researchers Harman, Schwieterman, and Kasting (Harman et al., 2015) examined what would happen if the early Earth was orbiting around different stars, ranging from a star slightly more massive than the Sun (an F type star) to a star less than half the mass of the Sun (an M type star). For the Earths orbiting smaller stars, the interaction between the atmosphere of the planet and the radiation from the star meant that some abiotic oxygen was produced. This could mean that when we look at distant planets around some types of stars, the presence of oxygen alone may not be a sure sign of life. To pick out false positives such as this, Schwieterman, Meadows, Domagal-Goldman, Deming, Arney, Luger, Harman, Misra and Barnes (Schwieterman et al., 2016) published a seminal paper on using CO in transmission and O4 in both transmission and direct imaging spectra to help discriminate between abiotic O2/O3 produced by atmospheric loss or photochemistry, and O2 produced by a photosynthetic biosphere. This figure shows the difference in Earth's spectrum due to the N2-N2 dimer. 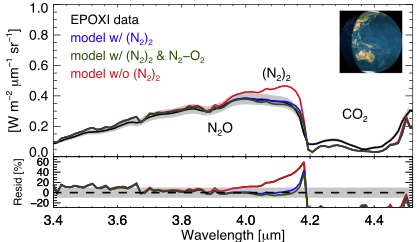 The model without the N2 dimer (red line) cannot reproduce the spectrum observed by the EPOXI spacecraft (black line). Mini-Neptune GJ 1214b is an exciting target for study because it is near enough to spectrally characterize. However, to date, its spectrum has revealed little except that the planet has a high altitude cloud or haze layer obscuring the lower atmosphere. To model mini-Neptunes and ultimately learn how these - likely uninhabitable - worlds can be discriminated from habitable super-Earths, NPP posdoc Benjamin Charnay, along with Meadows, Misra and Arney developed 3D models of GJ1214b’s atmosphere using the Laboratoire Meteorologie Dynamique’s LMDZ. Charnay, Meadows & Leconte, (2015a), described the new LMDZ mini-Neptune model and analyzed the atmospheric circulation and the transport of tracers in GJ1214b's atmosphere, which are important to understand the photochemistry and cloud formation on mini-Neptunes. In Charnay et al., (2015b) we performed the first 3D simulations of realistic clouds on a gaseous exoplanet, and validated the model by reproducing the observed HST transit spectrum of GJ1214b. 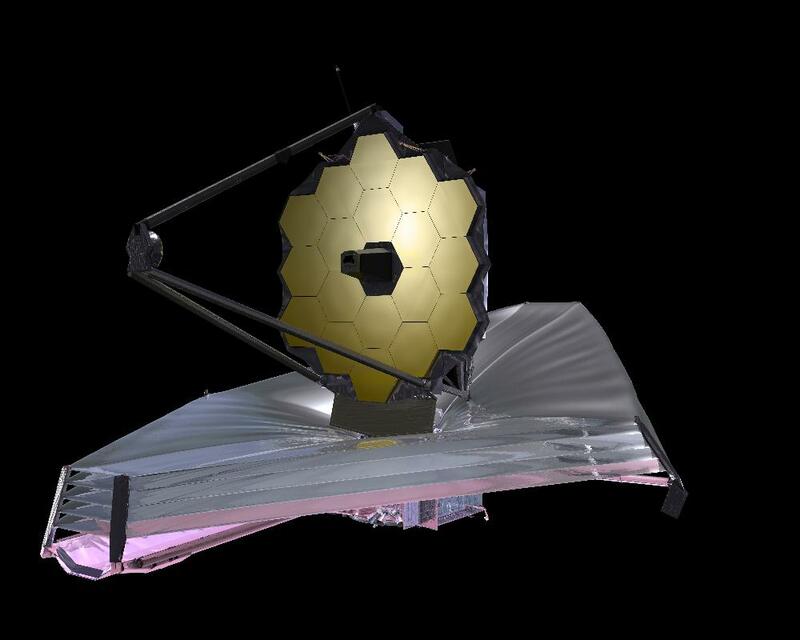 We then predicted what information could be obtained with future telescopes and in particular showed that mini-Neptunes should show strong features from molecules longward of 3um in JWST transit spectra, even if haze precludes deeper observations at visible wavelengths. This work provides insight into the best observational techniques to decipher cloudy atmospheres, and how to distinguish mini-Neptunes from potentially habitable ocean exoplanets. 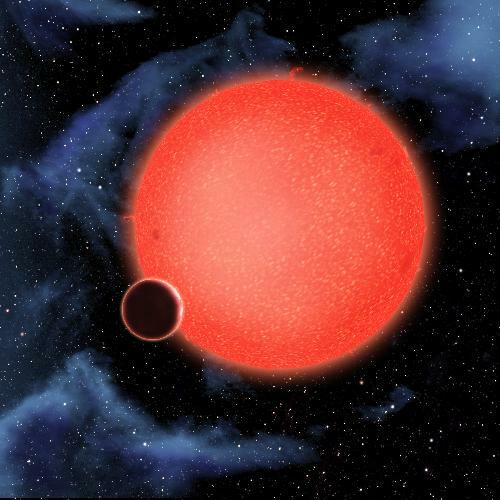 An artist's depiction of the star GJ 1214 with its planet GJ 1214b. For a third of life’s history on Earth, the planet’s atmosphere contained little or no oxygen. In such an "anoxic" environment, two of the main biosignature gases (O2 and O3) would not build up to detectable concentrations. In Domagal-Goldman et al. (2011) VPL researchers show how biogenic sulfur gases could be used as biosignatures for such a planet. We found that for extremely high production rates of these gases, or for planets around stars with low UV-fluxes, these gases would be directly detectable. We furthermore found that for lower (modern-day) fluxes on planets around cooler stars than our Sun, the effects of these gases on atmospheric chemistry could be detected via an increase in the planet’s ethane to methane ratio. This work lays out a strategy for finding life on an anoxic planet, a type of biosphere that could represent a significant portion of the inhabited planets in the universe.